Property Location Located in Ojai, Blue Iguana Inn is close to Ojai Valley Museum of History and Art and galerie102. 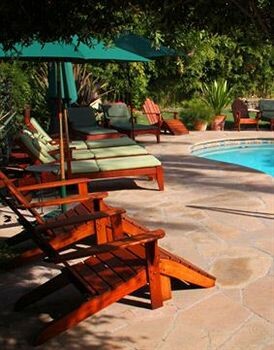 This condo is within close proximity of Ojai Art Center and Soule Park Golf Course.Rooms Make yourself at home in one of the 14 individually decorated guestrooms, featuring refrigerators and iPod docking stations. Rooms have private patios. Cable programming and DVD players are provided for your entertainment, while complimentary wireless Internet access keeps you connected. Private bathrooms with shower/tub combinations feature complimentary toiletries and hair dryers.Rec, Spa, Premium Amenities Enjoy recreational amenities such as an outdoor pool and a spa tub. This condo also features complimentary wireless Internet access, supervised childcare/activities, and a picnic area.Dining A complimentary continental breakfast is included.Business, Other Amenities Featured amenities include express check-in, express check-out, and complimentary newspapers in the lobby. Free self parking is available onsite.